Why was a Jewish girl with a cut face not as compelling a story as a Muslim girl with a cut hijab? We live in bizarre times when bigotry, intimidation and violence are all but ignored while imaginary fears and faked crimes are amplified. The shocking rise of anti-Semitism in Europe, and increasingly in North America, should be ringing alarm bells around the world. In the past decade, we have seen an unprecedented number of Jews leaving France and a worrying percentage departing Belgium and Italy. The Jewish population is also decreasing in other parts of the continent tarnished by the horrors of the Holocaust. One in 10 Jews in France has suffered a physical assault, according to a 2016 Ipsos survey, and a 2013 EU poll revealed three in four are so fearful of attacks they no longer publicly display signs of their religion such as wearing the Star of David. In Sweden, threats, harassment and attacks against Jews have become commonplace and yet we rarely hear about such incidents. The same commentariat who obsessively write, talk and tweet about racism and supposed Islamophobia rarely mention the fact that Jews are the biggest victims of religiously motivated attacks in much of Europe as well as in the US and Canada. Two recent incidents involving “hate crimes” perpetrated against vulnerable schoolgirls perfectly illustrate the perversity of fanning faux fears while ignoring real attacks. In the northern Paris suburb of Sarcelles, a Jewish girl’s face was slashed with a utility knife in what many, including French politician François Pupponi, are calling “a heinous anti-Semitic attack”. The 15-year-old victim was wearing the uniform of a local Jewish school when attacked, and the knifing followed several other anti-Semitic incidents, including this month’s torching of two kosher shops. The crime barely received any coverage. 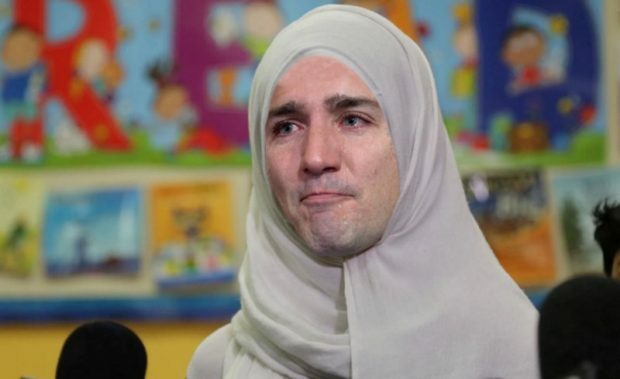 A few days later, we heard about the ordeal of a Muslim girl in Canada who, on the way to school, was approached by a man with scissors who cut the end of her hijab. Within an hour, the media were in overdrive, reporting this horrifying example of Islamophobia. Political leaders including Toronto mayor John Tory, Ontario premier Kathleen Wynne and Prime Minister Justin Trudeau condemned the attack. The story was front-page news and inspired a multitude of outraged comment pieces seizing on the crime as an example of the virulent Islamophobia in the West. The only problem is, it never happened. Three days later, Toronto police confirmed the attack had been faked. The girl’s family, who were by her side at the press conference, apologised. No one will face any charges. But even after the hoax was revealed, there were multiple pained feelpieces warning of an Islamophobic backlash in response to the faked Islamophobic backlash. Put to one side that the attack on the Canadian girl didn’t happen, and ask: why did one of these attacks receive saturation coverage from mainstream and social media? Why was a Jewish girl with a cut face not as compelling a story as a Muslim girl with a cut hijab? One reason is that crimes against Jews in the West are increasingly perpetrated by Muslim migrants, and that doesn’t fit the narrative pushed by activists in the media class. Of course, those with an agenda to push are not interested in facts, figures or fairness but what has been truly disappointing is the way the Jewish community has been let down by political leaders. In Sweden, the number of anti-Semitic attacks has skyrocketed in the past decade. Swedes are having to confront the uncomfortable truth that they have imported old hatreds and the type of diversity not associated with tolerance. Attacks against Jews, Jewish businesses and properties have soared. The statistics provide a stark reality check for the deliberately blind who don’t want to acknowledge the cause of the violence. Just over half of all anti-Semitic attacks in Sweden are committed by Islamists, about a quarter by Left-wing extremists, and 5 per cent by neo-Nazis or Right-wing extremists.